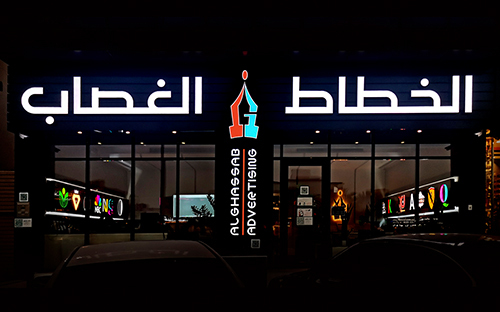 Al ghassab is an advertising company, that effectively used on board works and printing works. We mainly focused on Display Board Works, Flex Works, Name Board, Neon, Zincore Board ...etc. 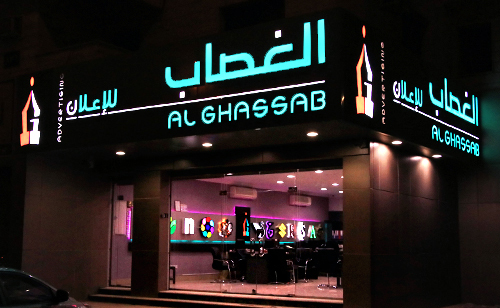 Al Ghassab Advertising company provides Large Display Board and other Printing Board works. These services are completed utilizing the advanced machine and contemporary technology. We are highly acknowledged. Advertising is one of the most usable identity of business. We use only high quality of board works. Each and every business should be needed to highlighting their business trademark. So we give quality flex and print output. Acrylic is a type of sign board that denotes to give information about the way you can search; In other words a path sign to choose where can you go. Al Ghassab advertising is giving you a quality output. Our working process based on different stages. Planning and Strategy, Design and Develop, Test and Deliver product to the customer. Planning and Strategy is most valuable step; that will help to go smoothly. We are bother about your company and your ideas. Our Working progress going under the calm atmosphere. Our workers are fully intelligent and very experienced their works. After every work, we checks all items of your material. Our workers always beware of that. The delivery and Fitting is very fast and fully covered. Al Ghassab Advertising is giving you the best quality output and best services. We will do in our best in your project. Our working place under our Head office. Highly skilled professionals work here. They will guide you the correct way of your works. Our branch office works under Head office. Our all works going very smoothly and perfectly. You can ready and follow with us. WE FOLLOW BASED ON YOUR IDEAS. We always had this statement and we're keeping our promise. Beside Al Ghassab advertising has lots of features that wait to be discovered. © 2018 All rights reserved. Al Ghassab Advetising.